The clinicians and staff members of the Small Animal Emergency Service at NC State University’s College of Veterinary Medicine urge pet owners to keep Halloween enjoyable and free from a scary trip to the veterinarian. Keep people food and candy from pets, of course. It may be hard to keep track of pets, goblins, bags of candy, and easy access to party food, but ingesting chocolate, candy sweetened by xylitol, lollipops with sticks, or the wrong snack can lead to a mournful night. It’s a good idea to keep pets indoors from sundown to sunup to avoid encounters that could scare both young zombies and your pet. In fact, placing your pet in a safe and quiet room away from the strange comings and goings of the noisy, costumed trick or treating crowd is a good idea. If you can’t resist dressing your dachshund like a hotdog, try the outfit on in advance to gauge your pet’s reaction and to ensure the costume is comfortable and does not restrict vision, hearing, or movement. No small parts, loose ends, or anything around the neck and do not leave a costumed pet alone. If you are taking to the streets with a four-legged vampire, make sure the leash is strong, the outfit has reflective tape, and Dracula is wearing a collar and tags AND IS MICROCHIPPED! Many dogs will not enjoy the experience so be alert to your pet’s disposition. If you decorate your home with candles, pumpkins, displays, or glow sticks, ensure there isn’t anything within your pet’s reach or wagging tail that can be eaten or knocked over leading to choking, shock, burns, or a visit from adults dressed up as firemen. If you do have an unexpected scare and your veterinarian is not available, the NC State University Small Animal Emergency Service is here 24 hours a day, seven days a week. 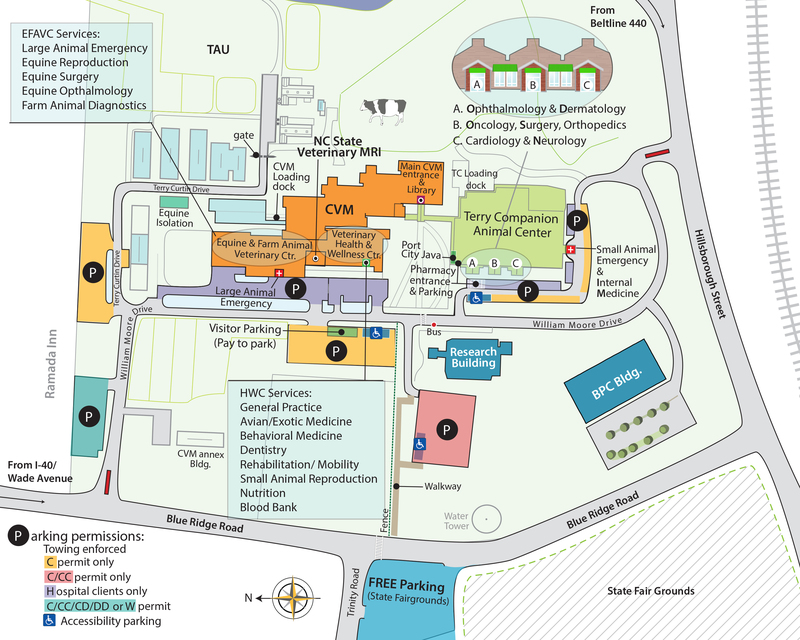 The location of the Terry Center is 1052 William Moore Drive near the intersection of Hillsborough and Blue Ridge in Raleigh, NC. Please call 919.513.6911 to inform clinicians of your pet’s emergency.